I know that for most people the idea of spending time in a swamp brings up images of alligators, snakes, and swarming mosquitoes. Things that should be avoided, especially when on vacation. But The small town of Uncertain Texas on the edge of Caddo Lake is one of those quite hide a ways that is so special that I feel guilty telling others about it. 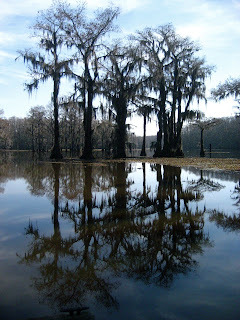 Caddo Lake is a hunting & fishing paradise, but if you go off season the lake will transport you to a world that is filled with the sounds of birds, frogs and yes the rumble of distant alligators. When the sun cuts through the spanish moss covered trees the water becomes a rippling mirror. And the town of Uncertain is a culture unlike any other in Texas. Well not only was February 2nd Groundhog day it was also the first ever event to be held at the property of La Reunion TX. The focus of the event was the artistic killing of 7 trees by 7 artists, including myself. We selected sick or non-native trees to turn into biodegradable art. In this way the property will return to its natural habitat while providing habitats for bug and animals. 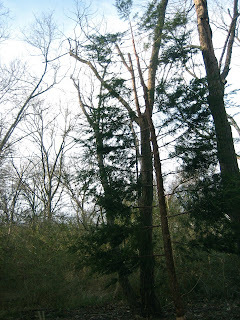 For my project I selected a small cedar (14’ tall), removed all the branches, cleaned up the trunk, and then doweled the branches back onto two sides of the trunk. The result was a two dimensional tree that looks similar to a pressed flower.